CMA CGM Group and PSA launched the second stage of the joint container terminal CMA CGM – PSA Lion Terminal (CPLT) in the port of Singapore. The CPLT terminal has now capacity of 4 million TEU per year after opening of the two new berths with capacity of 2 million TEU per year, which doubled the terminal capacity. 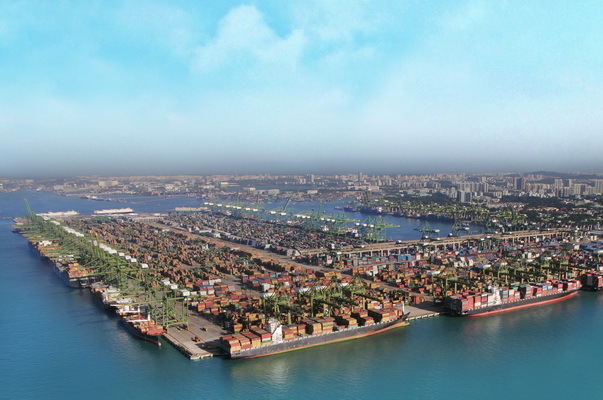 The CMA CGM – PSA Lion Terminal became a regional hub for CMA CGM operations in Asia. The terminal, which now spans four mega container berths at Singapore’s Pasir Panjang Terminal 5, has achieved high service levels with an average gross berth productivity of more than 160 moves per hour for the mega vessels since the beginning of this year. “This is another exciting milestone for CMA CGM as part of the Group’s continuing efforts to make Singapore our main hub in the region, while reiterating the importance of Singapore to our global strategy”, said the Senior Vice President Asia of CMA CGM Asia Regional Office, Jean-Yves Duval. The joint venture between CMA CGM Group and PSA was announced in July 2016 for participating in development of the Lion Terminal, which was started in second half of 2016. Port of Singapore takes the second place in the rating of the largest container ports of the world, reporting 30.9 million TEU handled by the end of 2016. The growth in volumes in the second half of the year allowed the port to narrow the gap with the result of 2015 to a minimum, despite a strong fall in turnover in the first months of 2016. According to analysts the port of Singapore will benefit from the reorganization of liner routes linking Europe and Asia, after opening restructuring of global carriers’ alliances from April 1. Singapore will be the only hub for The Alliance in Southeast Asia. The port will receive 34 weekly calls within the framework of 29 services of all three alliances on the Asia-Europe trade, compared with 29 calls at 27 services to date.